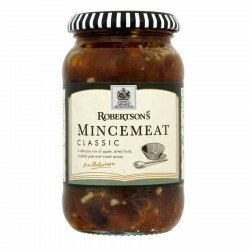 A typically British fruit blend filling for the traditional "Mince Pie", made for New year's celebrations. A delicious blend of apples, dried fruits, candied citrus and spices peel. Mincemeat is the traditional filling of "mince pies" served for Christmas in British families. Just fill in your pies, pastries for a perfect dessert! 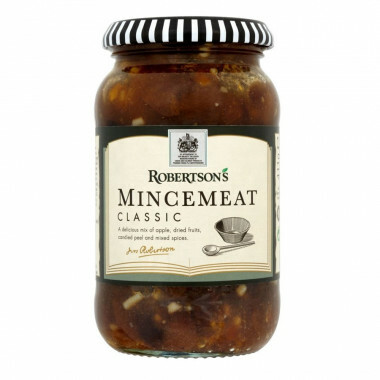 Ingredients: sugar, apples (26%), vine fruits (26%) (sultanas, raisins, currants), candied mixed peel (4%) (glucose-fructose syrup, orange peel, sugar, lemon peel, citric acid), vegetable suet (palm oil, sunflower oil, rice flour), treacle, acidity regulators (acetic acid, citric acid), mixed spices, citric acid, antioxidant (ascorbic acid). Refrigerate once opened an consume within six weeks. Best before end : see lid.